At first glance, Tae Kwon Do and strength training may seem like two disparate forms of physical preparation. One is a Korean martial art; the other is a way to build muscle. Upon further inspection, however, they actually have a whole lot more in common than you might think. 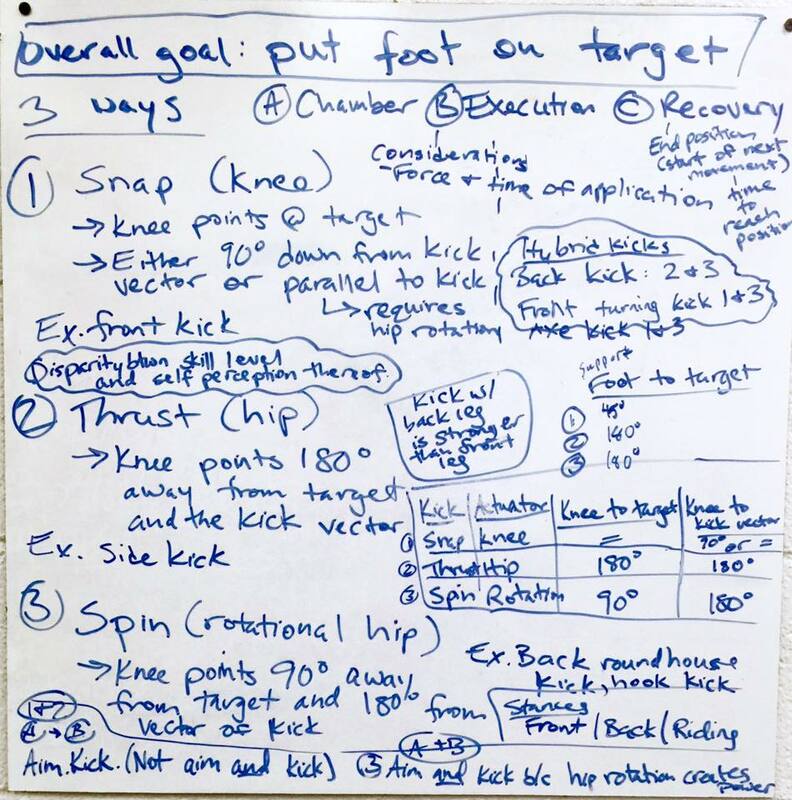 When my friend and black belt Chris DiToro (of Paek’s Martial Arts School in Abington, PA) asked me to meet up last week to discuss the biomechanics of kicks, I jumped at the opportunity. There’s nothing I love more than talking shop with other movement professionals — especially when they’re coming at it from such a unique angle (i.e. Tae Kwon Do). Master DiToro did not disappoint. To begin, we discussed the basic premise of Tae Kwon Do. 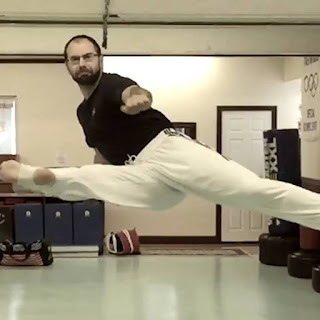 Just like strength training, in which the goal is to move a load from one place to another, there is really only one goal in Tae Kwon Do: to put your foot on the target — be it someone’s head, a wood board, whatever. The target will depend on the purpose of one’s practice, a point DiToro emphasizes with his students before every training session. For example, in a scored competition, the front side of the body is always the target, since only strikes landing there result in points. For self-defense in a street fight, on the other hand, anything goes. A kick to the kidneys (mid-back), for instance, might be most effective. In strength training, the target application of the practice is also of the utmost importance. For example, an Olympic lifter will probably perform a clean differently from a football player (i.e. full squat clean vs. hang power clean). The former is training for competition in that sport, where the purpose is to lift the heaviest weight once. The latter is using the lift as a tool to aid performance on the field. For the football player, the exact weight on the bar is less important than simply developing explosive hip extension. Of course, there's a little bit more to Tae Kwon Do than simply putting your foot on the target. This was made abundantly clear as soon as DiToro began demonstrating his craft for me. I watched in awe as he danced, spun, and flew through the air. Every kick was lightening fast and perfectly crisp; every landing was soft as silk. Sometimes he would unleash just one lethal kick at a time. Other times he would string together several in a row. The chamber is the setup of the kick, where the majority of the aiming occurs. During the chamber, the knee must be aligned at the correct angle in relation to the target. The execution is the actual delivery of the kick. Just prior to execution, a decision must be made regarding the direction, time of application, and "foot print" of the kick. A longer contact time over a greater surface area will create more space for the subsequent move, whereas a shorter contact time over a small surface area could break a rib. The recovery is the simultaneous landing from the kick and initiation of the next movement. During the recovery, DiToro emphasizes the distinction between precisely placing the feet back on the ground and just falling back down. The three phases of the kick are strikingly similar to the phases of lifts in strength training (get it, strikingly?!). The chamber is essentially the setup for an exercise, the execution is the concentric (lifting) phase, and the recovery is the eccentric (lowering) phase. In reality, every human movement is a series of positions and transitions between those positions. If you don’t have the prerequisite ability to assume the correct positions, it makes it much more difficult — if not impossible — to execute the transitions between them. Take a kick, for example. If the angle of the knee in relation to the target is slightly off after the chamber, the martial artist is forced to attempt to correct this error dynamically during the execution of the kick, which then limits his or her ability to produce force. Likewise, if a lifter's shoulders and and hips aren’t set just right in the setup of a squat clean, there’s a much greater chance that he or she will miss the lift. Every kick in Tae Kwon Do can be boiled down to one or a combination of these three. This categorization system is directly analogous to strength training, where we classify exercises as knee-dominant (squats, lunges), hip-dominant (deadlift, hip thrusts), and rotational (medicine ball side throws) and describe the orientation of the load relative to the body (so-called “load vector training”). 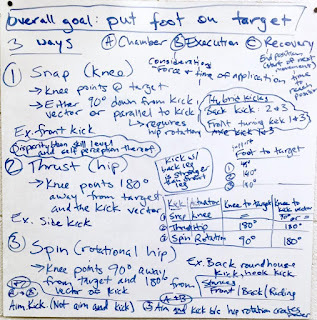 From a Tae Kwon Do teaching standpoint, DiToro's three-kick framework dramatically simplifies a litany of exercises down to far more manageable steps. Once the snap, thrust, and spin kicks have been mastered, they can be combined to produce what would otherwise appear to be entirely novel kicks. Take a back kick, for example. A back kick is nothing more than the combination of a thrust and a spin. Again, this is comparable to teaching a squat clean, which is just the combination of a power clean and a front squat. In both situations, from a motor learning standpoint, instructing a student or trainee to combine two skills that they’ve already mastered is far easier than teaching them a brand new. Of course, in DiToro's experience — after many thousands of hours of practice — all you really have to do is put your foot on the target. When watching a martial artist at that level, even my biomechanics brain turns off momentarily to behold the beauty of the art. The whiteboard result of our meet-up.